Google today held its annual "Made by Google" fall event, unveiling a new line of products that included the all-new Google Pixel 3 smartphone, a screen-based smart speaker, and a new tablet. Notably, Google pointed out at the beginning of its presentation that 2018 marks the 20 year anniversary of the search giant. The central announcement at the event was the 5.5-inch Google Pixel 3 and 6.3-inch Pixel 3 XL. The Pixel 3 XL has an edge-to-edge display and a notch at the top of the smartphone that holds its front-facing camera system, akin to iPhone X onwards. Unlike Apple's smartphones, the Pixel 3 XL has a chin on the bottom of the device. The company focused on the Pixel 3's advanced camera, including an HDR+ mode and "Top Shot," which automatically captures multiple shots with HDR+ and recommends one that might be better than your photo. Night Sight will enhance photos captured in low-light scenarios, and Google compared nighttime images on the iPhone XS with those taken on Pixel 3. Users can also now edit the depth of field effect in portrait mode, like on iPhone XS and XS Max. The second camera on the front of the Pixel 3 smartphone allows for a group selfie feature, which captures 184 percent more of a scene than the iPhone XS, according to Google. The new smartphone also has a few AR features on the camera called Google Playground, including characters from The Avengers and an animated version of Childish Gambino created in partnership with Donald Glover. Outside of the camera, Google Pixel 3 has a Call Screen feature, where Google Assistant can answer a call for you when you can't or don't want to pick up the phone. The Assistant asks the caller who is calling and to leave a message, and the entire conversation is transcribed live on the smartphone, so you can read along as the conversation happens. 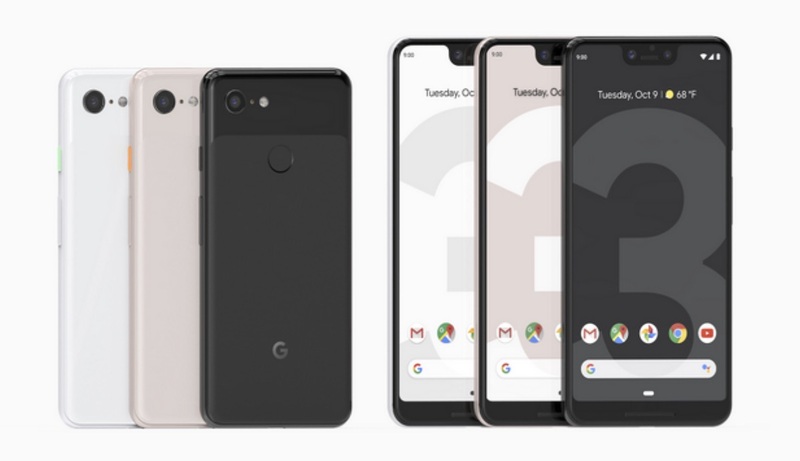 Google Pixel 3 is available to pre-order today and launches on October 18 in the United States and other countries, starting at $799. The Pixel 3 XL starts at $899, and both are available in Just Black, Clearly White, and Not Pink. A new Qi-compatible Pixel Stand will also be available for $79. Google Home Hub is the company's latest smart home speaker, allowing users to access YouTube, Google Photos, and more on its 7-inch screen. Google says it decided to not include a camera in Home Hub to enhance privacy, and an Ambient EQ feature automatically adjusts display brightness in relation to the light in the room. The company gave numerous examples of how you can use Google Home Hub, including following recipes in the kitchen provided by Tasty, or controlling smart home products. In regards to the latter feature, Google built a "Home View" section on Home Hub, where you can drag down from the top of the screen to see a quick update on your smart lights, locks, and thermostats in one place, like Apple's Home app on iOS. The Google Home mobile app is also updating to match Home View's design. Google Home Hub will cost $149 and launch later this month on October 22. 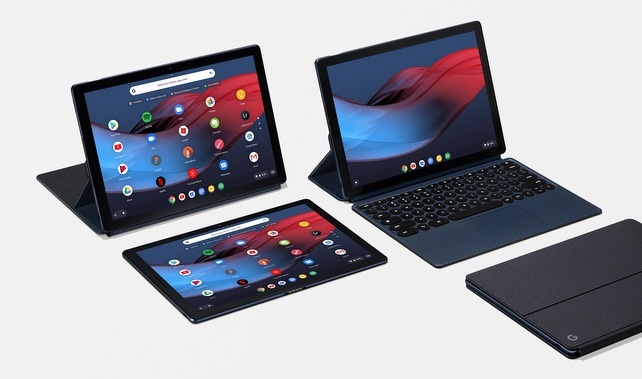 The company then went on to talk about the Google Pixel Slate, a new Chrome OS tablet that is aimed at use both in the workplace and for entertainment at home. The tablet has dual front-firing speakers, 8MP rear and front facing cameras with portrait modes, a 12-hour battery life, and a 12.3-inch Molecular Display with 293 pixels per inch. On Pixel Slate, Chrome OS has been adjusted to specifically fit the tablet. This includes features like split screen, a new app launcher, deeper integration with Google Assistant, family link, do not disturb, and "nightlight" to reduce blue light on the display at nighttime. Google Pixel Slate will start at $599 when it launches later this year in the United States. A connected keyboard and case accessory, the Slate Keyboard, will cost $199, while the Pixelbook Pen in a new midnight blue color (to match Pixel Slate) will cost $99. More information on Google's announcements can be found on the company's website and on the Made by Google YouTube channel. Alternatively, you can just write some of your most private information on a notecard and mail it to Google HQ in an envelope full of money. Notch and chin? Come on. For Google having unlimited resources, they sure do make UGLY products. That Home Hub looks like some sort of early 2000's cheap korean brand of tech you'd find on eBay. The Pixel 3 also looks horrible. This almost seems worth the price alone. The thought of sending spam calls into a loop of discussions with an AI assistant makes me very exciting. I'd like a button that after the transcription makes it clear this is spam we could push to put the AI into a delay and extend mode where it just trolls the spam caller for as long as it can until they hang up. That photo looks real to me. The people are sitting on a rock under the shadow of a tree, it’s not a common scenario but I can totally see the iPhone getting fooled by that set up. Pixel generally have the best camera of its generation so it will be interesting to see more in-depth reviews. For what I heard so far the Xs is on par with the pixel 2 and S9, maybe even a bit behind, so we’ll see if this is an incremental update or if google will leap frog again like they did with the original pixel and pixel 2. 840quadra's post answers your post perfectly. And no, that doesn't look like a real photo. That looks like someone disabled HDR, intentionally clicked on the buildings in the background to adjust white balance. Having shot many thousands of photos on my iPhones (tens of thousands), even I know this and I'm nowhere near a pro. That shot looks like it was intentionally fouled to make Google's photo look better. That notch, that chin. Urgh. It is literally like Google designers sat in a meeting and deliberately tried to make sure they did something worse than the iPhone, rather than beat it. SMH. Indifferent hardware specs as well. The software stuff is pretty cool, like answering the phone and transcribing for you, but otherwise all three devices are priced premium but massively underwhelm. Still gonna rock my Pixel 1, especially at those ludicrous prices. (Thanks Apple for helping make that happen). Was really hoping to want to upgrade.